The Wildebeest Migration is one of the “Seven New Wonders of the World” and known as The World Cup of Wildlife. If there is a safari you should go on, this has it be it. The Maasai Mara and the Serengeti National Park together form what no other reserve or park in Africa can! It is incredible, it is magical, it is indescribable, and it is a must! Nowhere in the world is there a movement of animals as immense as the wildebeest migration, over two million animals migrate from the Serengeti National Park in Tanzania to the greener pastures of the Maasai Mara National Reserve in Kenya during July through to October. 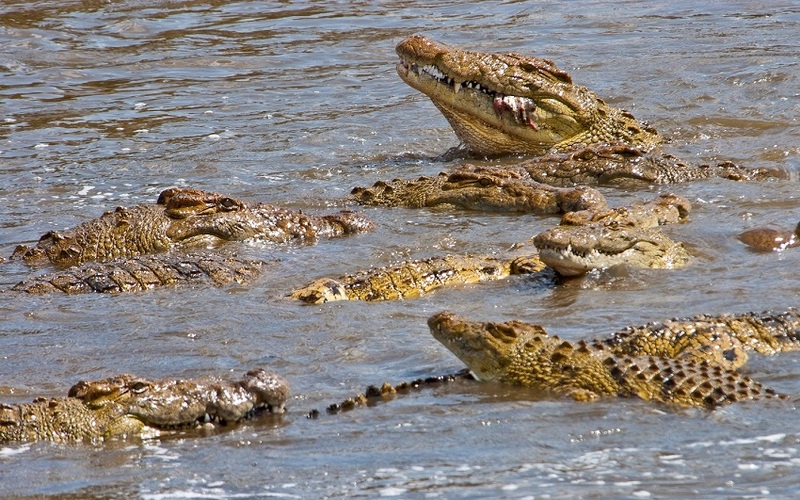 The migration has to cross the Mara River in the Maasai Mara where crocodiles will prey on them. This is one of the highlights as the animals try and cross the Mara River alive. In the Maasai Mara they will be hunted, stalked, and run down by the larger carnivores. The Maasai Mara also has one of the largest densities of lion in the world and is no wonder this is the home of the BBC wildlife channels Big Cat Diary. To find your perfect camp or lodge for the wildebeest migration please go to our accommodation page. Remember that the wildebeest migration normally starts from about mid-June to mid-October. February and March are great for the big cats and Christmas is again a stunning time. The stage on which this show is set is loosely termed the Serengeti Ecosystem, about 40, 000 square kilometers pretty much defined by the dominant migration routes of the white bearded wildebeest and comprises parts of the Ngorongoro Conservation Area in the south; the Serengeti National Park and the adjacent Maswa Game Reserve and other ‘controlled’ areas in the center, east and west; and the Maasai Mara National Reserve to the north. The principle players are the wildebeest, whose numbers appear to have settled at just under 1.7 million, with supporting roles from some 400,000 Thomson’s gazelle, 300,000 zebra and 12,000 elands. These are the main migrators and they cross the ranges of over a quarter of a million other resident herbivores and, of course, carnivores. The lions, hyenas, leopards, cheetahs and lesser predators await the annual coming of the migration with eager anticipation. In reality there is no such single entity as ‘the migration’. The wildebeest are the migration – there is neither start nor finish to their endless search for food and water, as they circle the Serengeti- Mara ecosystem in a relentless sequence of life and death. ‘The only beginning is the moment of birth,’ notes acclaimed East African author and photographer Jonathan Scott, who has spent the better part of the last 30 years chronicling the events of the Serengeti and Maasai Mara. Similarly, the only ending is death. Probably the most important element of the environment to its inhabitants is the weather and the cycle of four seasons per year undoubtedly has the defining influence on the migration. The seasons are reasonably defined: the ‘short dry season’ is typically December to February/March; the ‘long rains’ fall over a six-week period from March through April and into May; and the ‘long dry season’ is from June to September, with the two-week ‘short rains’ falling any time from October into November. There are however, no guarantees about these dates. For want of a better place in which to ‘start’ the migration, we’ll begin in January and February, when the wildebeest cows drop their young in a synchronized birthing that sees some 300,000 to 400,000 calves born within two to three weeks of one another, eight and a half months after the rut. The birthing occurs on the short-grass plains that, at the southernmost extent of the wildebeests’ range, spread over the lower northern slopes of the Ngorongoro Crater highlands and are scattered around Olduvai Gorge. Here, at the ‘cradle of mankind’ many notable fossil finds have been discovered, including some that show that wildebeest have grazed the Serengeti almost unchanged for over a million years. The annual period of birthing provides a feast for predators. Driving across the plains, one can count literally hundreds of hyenas and dozens of lions scattered about. It may seem that the wildebeest are doing the predators a favour by dropping their young all the same time, but in fact a surfeit of wildebeest veal in a very short period results in the predators’ becoming satiated and unable to consume as much as they would if the calving happened over a longer time span. The predators thus have only a limited impact on the population of newborn calves; any calves born outside the peak are far more likely to perish. To watch any birth is amazing but watching the wildebeest birthing verges on the incredible. A newborn wildebeest gains co-ordination faster than any other ungulates and is usually on its feet two to three minutes after birth. It can run with the herd at the age of five minutes and is able to outrun a lioness soon thereafter. Notwithstanding this, many do die within their first year, from predation (although research indicates only about one percent die this way), malnutrition, fatigue or disease. Many calves get separated from their mothers when the herds panic (which happens frequently) or cross rivers or lakes in their path. The calves then wander for days looking for mum, bleating and bawling incessantly. On rare occasions they may be lucky to find her, but no wildebeest cow will adopt a strange calf, even if she has lost her own and is lactating at the time. As it weakens, a lost calf becomes an easy victim for any watching predator, from jackal up to hyena and lion. Towards the end of the short dry season, around March, the short-grass plains of the southernmost Serengeti begin to dry out and the wildebeest begin (or continue) their journey, heading towards the western woodlands. How do they know which way to go? The wildebeests journey is dictated primarily by their response to the weather; they follow the rains and the growth of new grass. 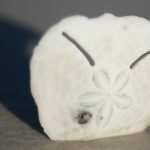 But it is probably instinctive knowledge, etched into their DNA by hundreds of thousands of years of natural selection, that is the major reason why these animals know in which direction they must travel. Over the millennia, those wildebeest that went the ‘wrong’ way would have died (of thirst and starvation) long before they could reproduce, so the wildebeest that lived to produce the future generations were the ones that went the ‘right’ way. From the plains around Olduvai the herds head west towards the trio of small lakes, Ndutu, Masek and Lagarja. At this time their biggest need is usually to find water, and these more westerly areas can provide it. Still feeding and fattening on the nutritious short grass the herds scatter widely across the plains, shifting on a whim in response to factors beyond our knowledge. On any given day they’ll be spread out in their tens and hundreds of thousands across the expansive plains west of Ndutu, the next they’ll be gone. By now the first downpours of the long rains will be falling, and the wildebeest will canter across the plains towards the distant thunderstorms, frequently returning a day or two later if the promise did not match the reality. As the rains set in, the herds head north-west past the granite outcrops of the Simba and Moru koppies and into the woodlands of the hilly country west of Seronera towards Lake Victoria. This is the time of the annual rut, with half a million cows mated in less than a month as the herds consolidate in the woodlands and on the plains of the Serengeti’s Western Corridor. The peak of the rut seems heavily influences by the state of the moon, with the full moon in May/June being a good bet for anyone seeking the most action. Seemingly vicious fighting between dominant or territorial males takes place during the rut, though there is generally little actual violence or serious injury. And in spite of these energetic duels, the males have little say over their choice of mates, for it is the females who do the actual choosing. From the western Serengeti the herds head north, following the rains (or their effects) into Kenya and the Maasai Mara Game Reserve. On their trek the wildebeests’ path is cut several times by rivers: in the Serengeti by the Mbalangeti and the Grumeti, and in Kenya by the Mara. For most of the year these rivers are relatively placid, but they can become violent torrents in response to rainfall in their catchments areas, and then they present major obstacles to the progress of the wildebeest. The rivers and indeed the few isolated lakes in the south of the Serengeti, are terrifying to the wildebeest firstly because of the animals’ fear of the water itself and the creatures it may hide, and secondly because water generally means vegetation, and thickets that may conceal predators. Yet the wildebeest have an inherent instinct to trek in a certain direction at any cost – despite their terror. The lakes in the south – Ndutu, Masek and Lagarja – for example, are little more than a few kilometres long, and could easily be walked around. But natural selection steps in once more: the wildebeest that crossed the lakes in previous generations survived to breed, so the waters pose no fear to their progeny; those that did not make it gave no further input to the gene pool. In his definitive documentary on the migration, The Year of the Wildebeest, filmmaker Alan Root describes how he watched a crossing at Lake, where, once the main body of the herd had crossed cows that had become separated from their calves turned back to look for them re-entering the water and swimming back. On reaching the other side, still not reunited with their offspring, they turned back once again. This toing and froing went on for seven days, until eventually the numbers of arriving wildebeest built up again and the stragglers were forced to move on with the main body of the herd. Thousands of wildebeest died in the lake that year. While such tragedies may appear to be a disaster for the wildebeest, the deaths only represent a mere handful of the hundreds of thousands of calves born each year. Without a degree of natural mortality, the wildebeest population could spiral out of control. 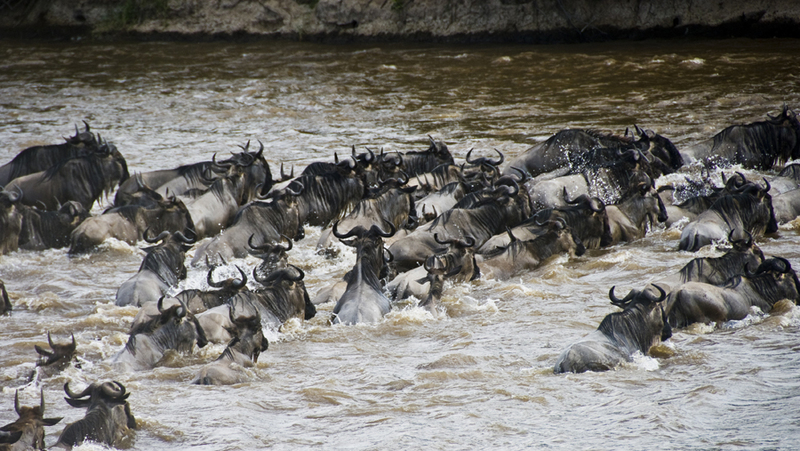 Wildebeest arrive at the Mara River in their tens of thousands and gather waiting to cross. For days their numbers can be building up and anticipation grows but many times, for no apparent reason, they turn and wander away from the water’s edge. Eventually the wildebeest will choose a crossing point, something that can vary from year to year and cannot be predicted with any accuracy. Usually the chosen point will be a placid stretch of water without too much predator-concealing vegetation in the far side, although occasionally they will choose seemingly suicidal places and drown in their hundreds. Perhaps, once again, this is because crossing places are genetically imprinted in the minds of the animals. Some fords do attract larger numbers of animals than others though, probably because they’re visible from a greater distance and the arriving herds are able to see others of their kind either in the process of crossing the river or grazing on the lush grass on the far side. Once on the grasslands of the Maasai Mara, the wildebeest spend several months feeding and fattening once more, taking advantage of the scattered distribution of green pastures and isolated rainstorms. A remarkable feature of their wanderings is their ability to repeatedly find areas of good grazing, no matter how far apart. The physiology of the wildebeest is such that it has been designed by evolution to travel large distances very quickly and economically, apparently requiring no more energy to run a certain distance than to trudge along at walking pace. Every facet of its life and behavior is designed to save time – wildebeest even mate on the move, and newborns are, as we have seen, up and running in minutes. While the wildebeest are drawn into migrating by the needs of their stomachs, the fact that they’re constantly on the move has the added benefit that they outmarch large numbers of predators. The predators are unable to follow the moving herds very far, for many are territorial and can neither abandon their territories nor invade those of others. Moreover, the young of most predators are highly dependent upon their mothers, who can’t move very far from them. By late October, when the first of the short rains are falling on the Serengeti’s short-grass plains, filling seasonal waterholes and bringing new flushes of growth, the wildebeest start heading south again. The herds trek down through the eastern woodlands of the Serengeti, some 90 per cent of the cows heavy with the new season’s young. Tightly grouped as they pass through the wooded country the wildebeest scatter and spread out again once they reach the open plains. A short version of the great migration circle. JANUARY: The herds are in Tanzania’s Serengeti, moving south from the north-east region and into the southern Serengeti, Ndutu area and Ngorongoro Conservation area – which often means out of the confines of the (unfenced) national park itself. It is calving season – prepare yourself for lots of wobbly babies… and lots of heartbreak as predators swoop in. FEBRUARY: The good grazing of the Southern Serengeti, Ndutu and Ngorongoro Conservation areas means the herds remain in the far south. MARCH: They are still in the south, but the grasses have all been munched up, the last calves born and the herds are starting to gather in preparation for the next leg. APRIL: Make sure you are on the southern Serengeti plains – the wildebeest begin their northward journey, and many have left already and are in the central and even western Serengeti. MAY: The massed herds are on the go, huge columns of up to 40km in length can be seen as the wildebeest funnel up into the central and western Serengeti. JUNE: Head for the central and western Serengeti – the herds are there and getting ready for the toughest part of their journey. JULY: Book early – it is the Big Event: river crossings. The herds have reached the western Serengeti and Grumeti Reserves and are peering closely at the brown waters of the rivers they have to cross. Why? Huge Nile crocodiles, that is why. AUGUST: The survivors celebrate by feasting in the northern Serengeti and begin crossing back into Kenya’s Masai Mara National Reserve. The eventful river crossings are bittersweet moments for the herds. SEPTEMBER: The herds break up into smaller groups – about half of the animals remain in the northern Serengeti, the rest are swapping stories in the Masai Mara (‘Did you hear that Nigel didn’t make it across the Grumeti?’). OCTOBER: Your best bet is the Masai Mara but bear in mind it is a far smaller reserve than the Serengeti and there may be a lot of other visitors. 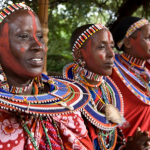 The conservancies in the Mara are much less crowded and, not only will you stil be able to witness the Migration, you will also be benefiting the Maasai communities who have lived there for thousands of years. NOVEMBER: The short rains have begun, propelling the wildebeest to leave the now denuded grasslands of the Masai Mara and back into the rejuvenated Serengeti. DECEMBER: Fresh grazing sees the wildebeest clustered in the north-eastern Serengeti (around Lobo in particular) as well as the southern Serengeti. Calving begins again, the predators move in again, and the cycle of life begins all over again. Serengeti National Park is Tanzania’s flagship conservation area and must-do centerpiece of the Northern Safari Circuit. The Serengeti’s unmistakable African setting will resonate with travelers on their first trip to Africa as well as old safari hands. Its vast rolling grasslands give a soul-stirring feeling of space and support hundreds of thousands of wildebeest and zebra as well as buffalo, elephant, giraffe and many gazelle and antelope species; red-robed Maasai tribesmen watch their grazing cattle warily – no prizes for guessing that the Serengeti is a big cat – and a photographer’s – paradise. Contiguous with Kenya’s Masai Mara, the Serengeti’s pleasant climate and abundance of resident wildlife ensures that it is an excellent year-round game viewing destination, but it is of course the great wildebeest migration that attracts most attention. Between November and August, the herds are on the move in the Serengeti, providing visitors with some of the continent’s most astonishing game sightings and predator-prey interactions – guided game drives and hot-air balloon safaris enable you to witness this phenomenon first hand. And you won’t want for comfort either: with everything from exclusive Serengeti honeymoon retreats to mobile tented camps and family-friendly lodges on offer, Serengeti safari accommodation is wide-ranging and of a very high standard, but you’ll need to book early for the best located lodges during the wildebeest migration. Remember however that the Serengeti’s adjoining private concessions offer limited visitor numbers as well as activities such as night drives and guided nature walks that are not available in the main park.